Well, that’s easy. It’s free! Thanks for reading! But really -- At its core, yes, it is free. However, for most businesses looking to manage their contacts effectively, the free CRM isn’t going to be enough. Recognizing this, HubSpot has a lot more to offer than just its free database that does come with a price tag. If you’re just learning about the HubSpot platform, taking a brief walk through its history as a tool will give you important context as to where the platform is today. Over the last 12 years, it has grown into a platform with a robust catalog of offerings including a CRM that integrates seamlessly with their marketing, sales, and service tools. When founded, HubSpot was primarily focused on small to medium-sized businesses (SMBs). Over time, however, they have scaled the platform to cater to larger teams in mid-market companies, as well as expanded their capabilities for SMBs. Most companies that leverage HubSpot aren’t going to just use one of the three core Hubs (Marketing, Sales, or Services) in tandem with the CRM, but a combination of them, which allows them to track your prospects and customers through their entire lifecycle, not just once sales starts working them. In this article, I’ll assume you’re already familiar with what a CRM is. If you’re new to that terminology, check out this article first. I’ll also assume that if you’re looking for a CRM, you’re looking for tools for your sales team and less so your marketing team. If you are looking for more information on what HubSpot’s CRM can do alongside its marketing tools, however, check out our complete guide to the HubSpot Marketing tools, including cost rundowns. If you’re just looking for a rundown of the cost of the CRM tools and what you get for each, read on! With it, you can have up to a million contacts in your HubSpot database with an unlimited number of users who can access that data, and you have access to tools to manage your database as well. Starting with the Free CRM tools is a great way to get your feet wet with HubSpot without having to make any commitment financially. If you don’t want to dive right into paying monthly for the platform but want to be able to see, touch, and feel what it is like and get a taste for the tools it includes, go for it! Whether you’re a one-man-band or a large team, there are really no strings attached to starting with the free CRM. However, it’s important to note that if you do decide to move to some of the paid tools, you will have to pay per 1,000 contacts, so be careful with bringing in your contacts (more on this in the next section). These features will allow you to keep your team’s contacts in one place and start to track deals that reps are working on, as well as create and manage follow-up tasks to stay organized. Ultimately, they allow you to get started with inbound selling at a basic level. At this point, you might be thinking, Wow! This sounds great. I get all this at no cost?? The answer is yes, but there are a few caveats that you should know about. Although you can store as many contacts in this database as you’d like, there are limitations on most of the other tools that only become available when you move to a paid version of the HubSpot Sales Hub. If you do decide to purchase any of the paid HubSpot Sales tools, you’ll move to a price per seat model for the Sales Hub, paying for each user in your portal individually. Also, while you can have up to a million contacts in the CRM, when you’re only using the HubSpot Sales tools, if you ever decide to start using the Marketing tools, you’ll have to start paying for every 1,000 contacts you have in that database. Honestly, unless you’re a very small team with a very simple process, you’re likely going to grow out of the Free CRM quickly and will need to start looking at the paid versions of the HubSpot Sales Hub. With that in mind, let’s break the cost for each level of HubSpot Sales Hub and what major benefits you get from each. 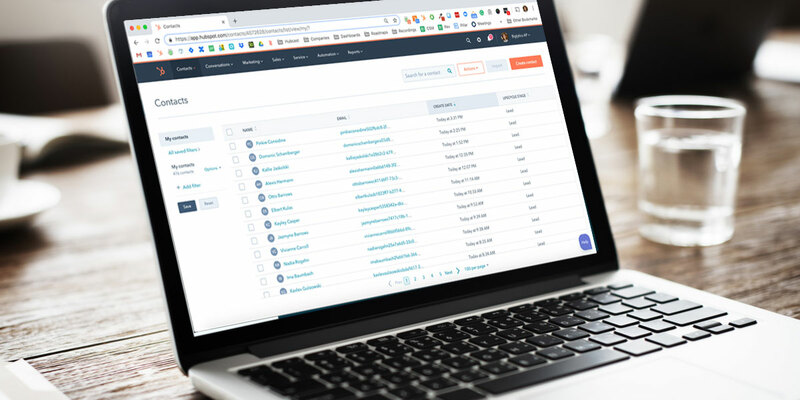 If you start using HubSpot’s Free CRM and associated free tools, you’ll quickly realize that there is a lot more to HubSpot than just the contact database. Once you’ve got your contacts uploaded, you can start emailing them right within the platform, creating follow-up tasks for yourself, and optimizing your process by creating email templates. You can even track when your most recent emails have been opened and clicked. However, all of these great sales tools actually have strict limits in the Free platform. You’re limited to five templates and snippets total, only one meeting scheduling link per person, and can only see your 200 most recent email opens. With HubSpot Sales Starter, all of those efficiency and productivity tools mentioned above become available on a massive scale. You’ll hit five email templates and one meetings link in a day, but it’ll likely take you years to ever hit the limits on those tools in Starter! With Starter, you get the first level of automation for the CRM: email sequences and automatic routing of incoming communications. The Sequences tool allows you to sequence emails and tasks over a period of time, and enroll contacts individually, so you can stop manually sending your prospecting email nurturing. The automatic routing feature allows you to specifically assign incoming emails and chat conversations to individual users. These automation tools combined with the unlocking of productivity tools like Templates, Snippets, and Documents (you can have up to 1,000 per user for each) is what drives the real value of the Starter tools. Start automating your follow-up and streamlining your sales workflows. But be careful, once you unlock that bit of automation and efficiency, you might not be able to stay away from Sales Pro. If you began your journey with HubSpot Sales in the Starter tools, as soon as your team starts to grow, you’ll quickly realize that your $50/user/mo investment is only going to get you so far. Your small team has gotten increasingly more efficient with email templates, follow-up and prospecting sequences, and tracking their emails, butwhat about all the other manual tasks they do every day? What about the records they have to update every time they move a deal to a new stage? Or the internal communications they have to send? As your team grows, you’ll be able to start automating manual tasks with deal-based workflows, and make sure the right people are notified when certain actions are taken in the CRM. But that’s not all you get with Pro. You also gain the ability to send one-to-one videos in your emails straight from the CRM, and create and send quotes to your opportunities. The last big piece of this puzzle is the Products tool. Starting with Sales Pro, you can create a library of all of your products (or services!) and easily attach them to your deals and track how your individual products are performing. What all of this means is that HubSpot Sales Pro gives growing sales teams the tools they need to not only be efficient with their tasks, but also automate them and make their prospects’ and opportunities’ experiences better. While the cost jump from Starter to Pro may feel like a big leap, the ability that the Pro tools give you to truly optimize your sales process makes them a virtual no-brainer for growing sales teams. If you can save your team time and enable them to close more deals faster, image the returns you could have on that investment! Sales Pro has a boatload of awesome features for Sales Teams, and it at this point you may be thinking, why would I ever need anything more? That’s because for many small to medium-sized sales teams with relatively straightforward processes, there isn’t a need for anything beyond Pro. But what about organizations with multiple sales teams and managers? What about larger teams trying to standardize their processes across many reps? Released in September 2018, Sales Enterprise is the newest level of the Sales Hub, and with its release, HubSpot demonstrated that they are not just a marketing platform anymore - they are a sales tool that’s here to stay. For individual reps, the feature set and workflow won’t change dramatically like it does between Start and Pro. What does change majorly is the ability for managers to manage their teams in the platform. You can create your team structure within HubSpot and start to require approvals for things your team is working on. You can also create sales playbooks to make sure all of your reps are following standard processes. Plus, with nearly unlimited (500 across the portal) custom reports, managers will be able to create the reports they want to see, as well as ones their reps want to see on a daily and weekly basis. Sales managers are also able to set quotas for team members and track individuals and teams against their quotas. Ultimately, choosing Sales Enterprise comes down to team size and complexity, and the needs of your sales managers. When evaluating the cost of the HubSpot CRM and Sales Tools, the main factors you need to consider are: your team size, the complexity of your sales process, and the projected growth of your sales organization. There’s no harm in starting with a less-expensive level of the tools to try them out, but know that if you’re serious about running an effective inbound sales organization, you’re going to need to invest financially. Got more questions about the HubSpot Tools? Reach out to us!